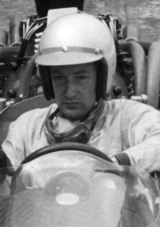 Chris Lawrence made two Formula One appearances in 1966 driving a special Cooper-Ferrari. At Silverstone he finished 11th and in the German Grand Prix he was forced to retire because of suspension problems. In 1959 he had founded LawrenceTune, developing cars for Morgan as a designer and technical advisor. In 2008 he brought out his autobiography, Morgan Maverick.